We’d love your help. 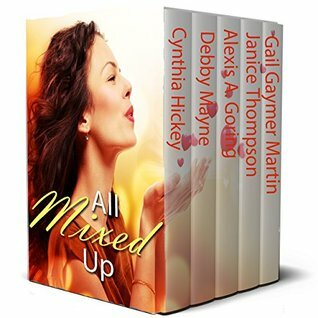 Let us know what’s wrong with this preview of All Mixed Up by Cynthia Hickey. To ask other readers questions about All Mixed Up, please sign up. Multi-published and Amazon and ECPA Best-Selling author Cynthia Hickey had three cozy mysteries and two novellas published through Barbour Publishing. Her first mystery, Fudge-Laced Felonies, won first place in the inspirational category of the Great Expectations contest in 2007. Her third cozy, Chocolate-Covered Crime, received a four-star review from Romantic Times. All three cozies have been re-released as ebooks through the MacGregor Literary Agency, along with a new cozy series, all of which stay in the top 50 of Amazon’s ebooks for their genre. She had several historical romances release through Harlequin’s Heartsong Presents, and has sold close to a million copies of her works since 2013. She has taught a Continuing Education class at the 2015 American Christian Fiction Writers conference, several small ACFW chapters and RWA chapters. You can find her on FB, twitter, and Goodreads, and is a contributor to Cozy Mystery Magazine blog and Suspense Sisters blog. She and her husband run the small press, Forget Me Not Romances, which includes some of the CBA’s best well-known authors. She lives in Arizona with her husband, one of their seven children, two dogs, two cats, three box turtles, and two Sulcata tortoises. She has eight grandchildren who keep her busy and tell everyone they know that “Nana is a writer”.